Oklahoma-based label VCI Home Video is developing an interesting catalogue, including a growing number of cult horror titles. Gargoyles is a memorable 1972 TV movie about an anthropologist (Wilde) and his daughter (Salt) who discover a race of ancient demon-like creatures awakening in the Arizona desert. It has the same atmosphere as episodes of The Night Stalker, which is to say that it’s quite like The X-Files. The creatures, which were realised by Stan Winston, look rather dated now, but the story is played with conviction (especially by Oscar nominated lead Cornel Wilde), and the film succeeds despite unimaginative direction. The movie has the look of a TV production, (it was given a theatrical release in Europe), but seems remarkably well preserved, (it lacks bite in the darker areas, which spoils the presentation somewhat). The disc has a satisfying stereo surround mix that adds weight to the music and sound effects. The disc also contains flaky trailers for The Bird With The Crystal Plumage and three other VCI releases Blood and Black Lace, The Night Visitor and Gorgo. VCI’s battered print of Mario Bava’s 1966 movie Kill, Baby… Kill! (aka Operazione Paura) is a little bleached out, and dubbed into English, but the pastel colours are strong enough to effectively convey Bava’s dream-like atmosphere, and the mono audio is adequate and largely hiss free. The film, a Gothic ghost story about a Doctor investigating a series of deaths in a Transylvanian village at the turn of the century, is one of Bava’s best yarns, and contains several very effective sequences and striking images. There are shorter edits of the film in circulation, under the title Curse of the [Living] Dead, but VCI’s disc is the complete eighty-five minute version. This disc also contains the Bird With The Crystal Plumage Blood and Black Lace and The Night Visitor trailers. Some time ago Image Entertainment announced their own DVD version of this film, with a widescreen transfer and commentary track by Video Watchdog editor Tim Lucas, but this has so far failed to materialise. 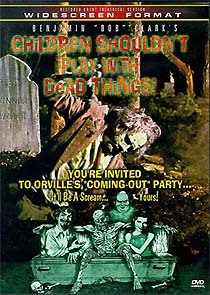 Children Shouldn’t Play With Dead Things (aka Revenge of the Living Dead) is a campy 1972 exploitation movie directed by the man who unleashed Porkys… and the rather more worthwhile 1979 Sherlock Holmes thriller Murder by Decree. The movie, little more than an elaborate student film, is about a group of overgrown teenagers who dig up corpses from a remote island graveyard for use in a magic ceremony, which results in them tackling bloodthirsty zombies. VCI have done pretty well in wringing out an image - albeit one that’s soft and subdued - from Jack McGowan’s gloomy cinematography. The film is presented in un-enhanced widescreen (1.85:1) ratio, from restored film elements. The disc also contains a hokey theatrical trailer, and a modest slideshow of front of house materials and press kit materials. Dario Argento’s 1969 directorial debut, The Bird With The Crystal Plumage (L’Uccello dalle Piume di Cristallo, has received a surprisingly good widescreen (2.35:1, 16:9-enchanced) transfer, with strong colours, making the most of three times Oscar winner Vittorio Storaro’s cinematography. The film begins with the attempted murder of a woman in a Rome art gallery, witnessed by a visiting American writer (Tony Musante). The writer continues to investigate the crime after the police lose interest. The film is a rather restrained effort by Argento’s later standards, and not much more than a straightforward giallo. As well as a stereo sound mix on the film, VCI’s disc also includes brief text biographies of Suzy Kendall, Argento and Musante, and the complete soundtrack album, by Ennio Morricone. The disc also contains the same Bird trailer that’s on the company’s other discs, a shoddy under-matted transfer of a very worn print. The disc is reportedly complete, but there are several instances where previously censored sequences have been patched over using a far inferior source, (a bit like Momentum’s restored Witchfinder General disc). The UK disc is cut by eighteen seconds.